Even in the best of times, amusement parks are chaotic, occasionally ugly, and full of danger. But when they are abandoned, they become tragic too. Here are some of the most incredible and sad portraits of fun zones that have gone to seed. Abandoned since the Hurricane Katrina struck the city in 2005. The park was flooded for weeks after the disaster. It was to be opened on May 1, 1986, but the Chernobyl disaster happened on April 26. The park was opened only for a couple of hours next day before the evacuation of Pripyat. Built by the PTL Club (Praise The Lord) founders televangelist Jim Bekker and his actual wife in 1978. The problems in Bakker's personal life in 1980s has been dropped the income and in 1989 Hurricane Hugo caused some damage. The park closed shortly after the storm. The Heritage Grand Hotel has been restored and still in use, but the outdoor amphiteater, the King's Castle, and the go kart track and arcade park has been completely demolished in the last months. This abandoned and unfinished amusement park was designed to be the largest amusement park in Asia, but construction stopped in 1998. The developers wanted to restart it ten years later, but they failed. The area has an unfinished castle and some medieval-themed buildings. Walt Disney bought the island in 1965 and opened as Treasure Island in 1974. It was a place to observe wildlife: here was the biggest colony of Scarlet Ibis in the United States, but five Galapagos tortoises, flamingos, lemurs, swans, brown pelicans and the last known dusky seaside sparrow lived here, too. In 2009, an urban explorer named Shane Perez visited the abandoned island and found there abandoned buildings, preserved snakes in jars, old employee photos and attacking vulture babies. The duck-themed rollercoaster killed a child in the late 1990s and another in 1999. Nobody of the park's leaders have apologized or said anything. The park was left in ruin in 1999 and demolished in the Fall of 2011. The cart from which the child fell down was also left in place. First it closed after one or two seasons because few deaths in the park, but it reopened in 1986 and operated until 1999. In the shadow of Mt. Fuji, there was a whole Lilliputian village with Jonathan Swift's lying hero. 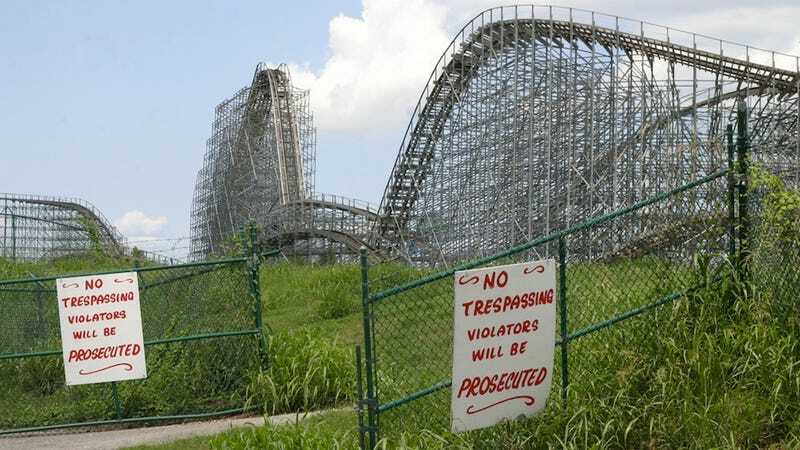 The park was really unsuccessful, and closed after only four years due to bank loans. Demolished in 2007. The only constant entertainment park in the GDR was really beloved among the people of East Germany, but the times are changing: after the Fall of Berlin Wall the new owners added some new attractions, but that wasn't enough to survive. Since 1999 the park has had to fight with large debts. In 2002 the owner, Norbert Witte, his family and some of the closest workers moved to Lima, Peru with six attractions in ship containers to "repair them". Witte failed to run his new park in Lima. Later he and his son were sentenced to seven (2004) and twenty years (2006) in jail for drug smuggling. This park had more than 24 amusement rides, a 1949 roller coaster, a miniature train (built between 1905 and 1910), and a Mammoth Military Band Organ (or Wurlitzer Style 160, built around 1905).